ANDREW JACKSON PIANOFORTE is an outgrowth of two lifetimes of professional piano work by Andy Launer and Jack Widner. Commissioned to open a downtown shopping complex in Columbus, Ohio in 1989, they have performed together ever since, throughout the United States. They have been recognized as Steinway Artists and Kawai Digital Clinicians. They have produced five recordings; one of the albums was written, arranged and performed by them. All projects were performed on nine-foot concert grand pianos. 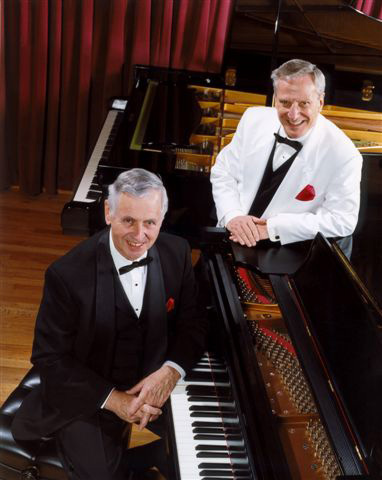 In a “Dueling Pianos” show reminiscent of the great piano duo Ferrante and Teischer, they also blend a liberal amount of humor in Victor Borge style. These mater artists are fun to watch and very enjoyable to hear. Audiences also enjoy a wide range of music from Gershwin, to Porter, Ellington and Disney, and much original material.